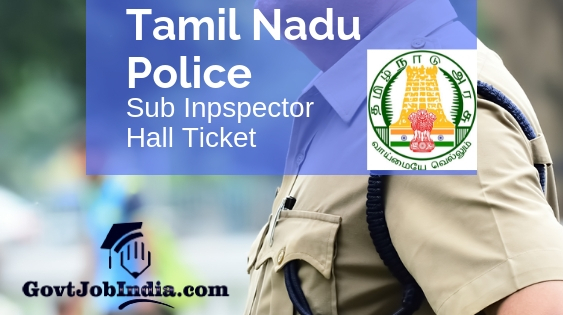 TN SI Hall Ticket 2019 Download– As the Tamil Nadu Uniformed Services Recruitment Board is preparing to conduct the written exam for the post of Sub Inspector and hence candidates will be required to download the TNUSRB SI Hall Ticket soon. The official website where the TN Sub Inspector Call Letter will be released is www.tnusrbonline.org. Contenders can download the TN SI Hall Ticket as soon as it is out. But since the TNUSRB Admit Card has not been published yet, candidates are advised to wait for a little while longer to have their call letter. The dates on which the admit card will be released has also been given in the segments below. When the TNUSRB Call Letter actually releases, we will make sure that we give you the direct link to download your admit card from our portal. You will not be required to browse through the other parts of the internet to find the Tamil Nadu SI Hall Ticket 2019. Moreover, if you have any doubts regarding the call letter or its release date, comment below and we will clear it out to the best of our abilities as soon as possible. Furthermore, in this article we have included the TN SI Exam Dates and the documents to carry to your Tamilnadu Police SI examination hall. Also, we have a whole section dedicated to the detailed process of how to download the admit card as well. As you may know, the TNUSRB SI Vacancy was for the posts of 969 Sub Inspectors in the Taluk, Armed Reserve and Tamil Nadu Special Police departments. If you wish to secure this vacancy, make sure that you go through the entire TN SI Syllabus 2019 for more details. So, now getting back to the topic of the TNUSRB Hall Ticket 2019, we have included all the details here on this page in depth. How to download TNUSRB Sub Inspector Hall Ticket 2019 Online? Go to the official portal of the TNUSRB or the Tamil Nadu Uniformed Services Recruitment Board which is www.tnusrbonline.org. You will have to search for the Tamil Nadu SI Admit Card 2019. Alternatively, rather than going through the first two steps mentioned, you can click on the link. This is a direct link to download the call letter. On the page which comes up, enter your registration details and submit this information. Your admit card will be on your screen for download. Do this and also take a printout of it. The Tamil Nadu Uniformed Services Recruitment Board has not given out the date when the recruitment examination will be conducted. But the exam dates will be specified on the hall ticket, for sure. Furthermore, the major parts of the state where the recruitment will be conducted are Coimbatore, Tirunelveli, Trichy, and Chennai. But the exam centres and the exact location where the examination will be held is yet to be decided. You will have to carry a few important documents for the recruitment exam. They have been incorporated in the segment below. Tamil Nadu Sub Inspector Hall Ticket. The GovtJobIndia.com team with respect to the article about the TNUSRB Sub Inspector Hall Ticket 2019? Was this information adequate for you? If yes, ensure that you broadcast this message with all those who might be looking out for the TN SI vacancy Admit Card 2019. Additionally, leave all your doubts in the comments section. Any difficulties can be addressed there and we will reply back as soon as possible. To conclude, subscribe to our website @ GovtJobIndia.com for any updates about the Tamilnadu SI Hall Ticket 2019.